In the 1970s in the backroom of a record store, Harold Bronson and Richard Foos were making history—and Rhino Records was born. Harold Bronson's The Rhino Records Story tells the tale of how a little record shop became a multi-million dollar corporation. Starting as an expression of Bronson and Foos' passion for rock music, absurdity, and an anti-establishment sensibility, Rhino soon outgrew its beginnings as a reissue label, taking on new artists and new mediums. Their accomplishments grew to encompass several gold record awards, the Best Label of the Year Award, the revival of careers of famous musicians, and the creation of a company to produce feature films including Fear and Loathing in Las Vegas. This behind-the-scenes look at a company considered by many to be the industry's best, reveals the secrets to their success. 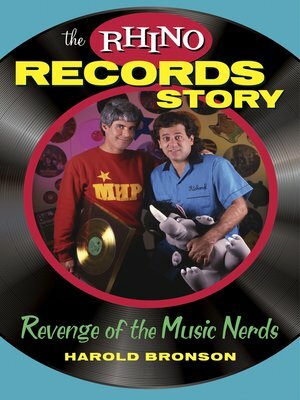 Written from the perspective of cofounder Harold Bronson, The Rhino Records Story divulges a unique business approach which made Rhino what it was at the height of its success. Woven throughout this story of a rising corporation, Bronson guides us through the ascent, fall, and revival of artists Rhino touched such as the Monkees, the Turtles, the Knack, and Frankie Lymon. In a mix of hard work, passion for music, and a flair for the unconventional, the story of Rhino Records takes shape. The owners also ran their company humanely, and were awarded the Clinton administration's only Corporate Citizenship Award given to an entertainment company. Rhino Records, as it was envisioned by Bronson and Foos, had higher priorities than the bottom line. Struggling against corporate interests, rock star personalities, and a perpetual underdog reputation, Bronson provides an exclusive insight into how the industry was run and how Rhino excelled. By the fans, for the fans, Rhino Records is the story of rock history, evolving pop culture, and a unique understanding of the music that mattered.